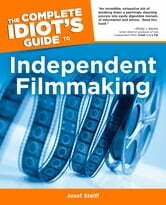 Designed for people who want to tell a story their way, 'The Complete Idiot's Guide to Indpendent Filmmaking explains everything a budding auteur needs to know, from literary development and financial and organizational pre-production to principal photography production, post-production assembly, exhibition and distribution, and more. The advent of desktop editing and a wide range of consumer cameras enable the average person to create a 'film studio' at homne. A great 'textbook' for novice filmmakers, whether film students or on-their-own auteurs. The proliferation of film festivals around the world, many of which encourage submissions from 'amateur' filmmakers, shows that there are countless filmmakers who aren't learning the ropes in school. Author has terrific credentials and has a feature-length script in development in Hollywood.